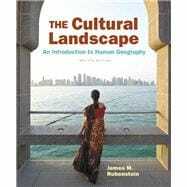 The Cultural Landscape: An Introduction to Human Geography , 12th Edition is also available via Pearson eText, a simple-to-use, mobile, personalized reading experience that lets instructors connect with and motivate students — right in their eTextbook. Learn more. Dr. James M. Rubenstein received his B.A. from the University of Chicago in 1970, M.Sc. from the London School of Economics and Political Science in 1971, and Ph.D. from Johns Hopkins University in 1975. He is Professor of Geography at Miami University, where he teaches urban and human geography. Dr. Rubenstein also conducts research in the automotive industry and has published three books on the subject–The Changing U.S. Auto Industry: A Geographical Analysis (Routledge); Making and Selling Cars: Innovation and Change in the U.S. Auto Industry (The Johns Hopkins University Press); and Who Really Made Your Car? Restructuring and Geographic Change in the Auto Industry (W.E. Upjohn Institute, with Thomas Klier). Dr. Rubenstein is also the author of the bestselling Contemporary Human Geography, as well as Introduction to Contemporary Geography. He also writes a weekly column about local food for the Oxford Press. Winston, a lab-husky mix with one brown eye and one blue eye, takes Dr. Rubenstein for long walks in the woods every day.